While we've got all the engine block 'unplugged' we've got a really good opportunity to get access to the bodywork which is normally obscured. While cleaning the bodywork where the washer pump normally sits, we found that the join between the inner wing and the return had been partly filled with the weather sealant which had been used throughout the engine bay. Rather than gouge out the sealant, as it had done such a good job so far, we decided to leave it in place and use some body filler to smooth out the top in line with the surrounding bodywork. Once all the pipes, cabling and surrounding areas had been masked off, we could start painting. Kitchen foil is really useful for quickly masking off pipework as it wraps around easily and stays in place. 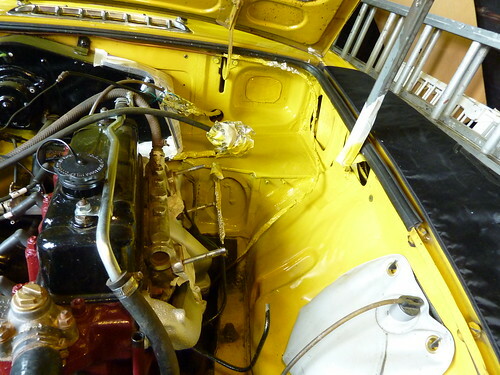 We applied three coats of Halfords Inca Yellow, over primer where the paint had come away. Once its had a polish, we'll clearcoat it to seal the surface.